To honor her dying father’s wishes, Chicago stockbroker Shelby Harmon promises to deliver a letter addressed to “Robert Nichols, Personal & Confidential.” Her quest to find Robert leads her to a most unlikely place: the Castlehill Gardens outside Scotland’s Edinburgh Castle. Who is this man and what is his connection to Harmony Lane, her family’s horse farm in Lexington, Kentucky? Robert’s friend, handsome and charismatic American Harrison Reed, offers to show Shelby the sights. As they explore the charming city together, they’re increasingly drawn to one another and dread their inevitable parting. 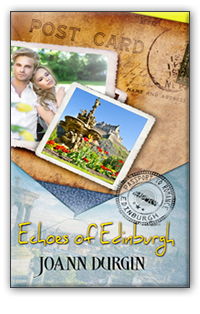 Did she lose her heart in Edinburgh…or find her way home again?